A recent survey My Yellow Brick Road conducted by The Western Union Company (NYSE:WU) reaffirms that migrant professionals residing in Saudi Arabia feel secure, happy and fulfilled in the kingdom due to a wide variety of reasons. There are 151 people participated aged 30 years in average, in the survey throughout Saudi Arabia. 46 percent think that safety is the key reason of their satisfaction, 44 percent think comfort of friendships is the best reason, while 34.6 percent think comfortable lifestyle in the kingdom is best reason. Participants said they had collectively achieved several goals, Money savings (54.6 per cent), a better lifestyle (38 per cent), buying a home (37.5 per cent), and paying for education (32 per cent). Saudi Ministry of Labor (MoL) will impose various fines on employers / companies who are unable to follow new regulations. Below is the summary of these fines under new regulations, please note we have compiled this for information sharing purpose only, you may visit actual news site for further clarification. SR 2,000 fine on employer on keeping passport of employee with him. SR 3,000 fine under wage protection program on companies who are unable to pay salaries on-time to their workers. This amount of fine will be for each unpaid worker. Furthermore workers will be allowed to transfer their services to another company without the need of approval from current employer. Wage protection program will be compulsory for companies who are having at least 11 workers and a maximum of 100 workers on Feb 2016. SR 5,000 fine on employer if he did not provide a copy of contract to his workers. SR 10,000 fine on employer for offering such a job to male worker which is restricted for female worker. Saudi Gazette has reported that Summary courts in Makkah and Jeddah have charged 24 with human trafficking and they are sentenced to 10 years imprisonment along with 1000 lashes and fine from 20,000 to 100,000 Saudi Riyals. Below is the infographic showing details of the court’s decision. Saudi Arabian Govt has provided a helpline for expatriates to discuss and solve their problems, register complaints against abuse of law by sponsors or anyone else. Expatriates can call this number 19911 and submit their complaint in a variety of languages available from Saturday to Thursday. Currently available languages are Arabic, English, urdu, Hindi, Indonesian, Amharic, Malayalam and Tagalog. QSaudi Blog has created a very useful graphic for this purpose which can be seen below. So if you are an expat in Saudi Arabia and you are having any difficulty regarding labor law, abuse of law or any other issues related with your company or sponsor feel free to dial this number and authorities will guide you to the possible solution. Your Work Life in Saudi Arabia: How will it be? Riding on a Camel back and moving across the sand dunes and winds in the Arabian Desert with an Arabic song playing in the background. The idea might seem synonymous to a lot of people’s perception of working in Saudi Arabia. But, is there any other shade to this cliched thought? Yes dear reader, there definitely is. Working in Saudi Arabia is a different experience altogether. Right from beautiful places like Dumat al Jundal and Jamarat bridge to the rich delicacies like Kabsa, Haneeth and Baladi cheese, this Kingdom has a lot to offer to those living here. Saudi Arabia gives numerous job opportunities to grow and excel in one’s professional life. However, the discussion to follow will talk about the work conditions and idiosyncrasies in this country. Giving it a quick glance might help you gain an insight regarding the professional life and work environment you’ll be facing, once you are there. What do you need to know about the employment contract? You will be provided with an employment contract which will specifically mention all the details of the pay-package. Any verbal communication will not be considered or covered by the contract. The employment terms mentioned should be in coherence with the labor law in Saudi Arabia, governed by the Ministry of Labor. Though you’ll be handed over an English-language contract signed by you and your employer before departing for Saudi Arabia, but you’ll be asked to sign an Arabic version after your arrival as well. Arabic version is the one that will be referred in case of any dispute. When checking the contract make sure the details regarding salary, job title and description, probation period, housing allowance and relocation costs are included. What are the working hours in KSA ? The number of hours you’ll have to devote to work per week varies between 40 to 48 in Kingdom of Saudi Arabia, depending on the organization’s policy. Office hours range between 7.30 am/8 am until 12 noon, then from 3.30/4 pm until 7 or 8 pm. Most of the government offices are open from 7.30 am to 2.30 pm with the general banking hours being 8 am until noon. However, in the month of Ramadan the working day is reduced to six hours, which a lot of companies apply only to the Muslim staff. Friday is the Muslim day of rest and if your firm has a five-day working week, the other day off will either be a Thursday or Saturday. What are the work ethics you need to keep in mind? Work ethics keep on altering once you are moving across the globe from country to country. In Kingdom of Saudi Arabia they are much different to those followed at any work destination in the world. Right from the most conservative style of dressing to a specific polite way of greeting your co-workers, this country has the most different set of work and business etiquettes in store for you. For instance, you will be expected to greet your colleagues by the title Sayed (Mr.) or Sayeda (Mrs.). Whilst working in Saudi Arabia you’ll also have to avoid scheduling any business meeting on Friday, which is generally known by the name ‘Juma’- meaning the prayer day. What is the remuneration available in different professions? According to a salary survey (in Saudi Arabia) by a reputed website the average monthly salary in the country is 16,252 SAR. However, the maximum salary is as high as 140,000 SAR and the minimum is as low as 833 SAR. The remuneration associated with some prominent professions in Saudi Arabia (as of 2nd Sep 2014) can be found below. What will be the entitlements associated with your job? Employment in Saudi Arabia includes a 21 days paid vacation for the first five years of your tenure. Some companies allow the employee to go on vacation only once in every two years. Hence, make sure that your work contract includes at least 21 days of paid vacation in a single year. From the 6th year onwards the number of vacations increases to 30 per year. However, if your employer has made you to sign a contract of 21 days’ vacation even after you’ve entered the sixth year of tenure, the law obligates him to pay you for the remaining 9 days per year once you’re leaving the kingdom. An employee working for more than 2 years is eligible for ‘End of Service’ benefits too. For less than 5 years: 1/3rd of the ESB award or half salary. For more than 5 and less than 10 years: 2/3 of the ESB award or half salary for the first five years and full salary for the next five years. For more than 10 years: Full ESB award or half salary for the first five years and full salary for the rest of the years. Working in the Kingdom of Saudi Arabia will make you a part of eight million expats in the country, thriving for a comfortable and secure work life. But, it might seem like a cake walk, once you are well acquainted with the norms and regulations followed in this country. expatriate women teachers on dependent visa (house wife iqama) can work at private schools without transferring their sponsorship to the school, This decision has been taken to tackle shortage of female teachers at private schools. Instead of issuing new teacher’s visas and source them from abroad Ministry decided to take advantage of locally available skilled female teachers. This will require a formal approval from the MoE (Ministry of Education) for each individual candidate. Expatriate Dependents can now work in Saudi Arabia at private organizations or International Schools without transferring their sponsorship to their employers, Saudi Gazette newspaper has reported. This decision by Ministry of Labor will allow local community schools or private schools to hire wives or daughters of expatriate workers who are already living in Saudi Arabia but unable to work due to their iqama status, which previously not allow them to work. This will reduce amount of foreign manpower required for local education system and help utilize existing manpower which is available here in the form of expatriate dependents. Expatriate dependents which are previously living in Saudi Arabia but unable to take part in development of country can now easily join hands with locals and can utilize their education and talent to bring prosperity in education sector of Saudi Arabia. I am emphasizing more on education because this sector lacks qualified staff and private schools are already taking benefit of expatriate dependents but in an illegal way (because govt does not allow dependents to work). However current move on MOL will bring a good change in local education system and it will make more and more qualified people available for hiring in schools and other organizations. Schools in Saudi Arabia were always having problems in recruitment of female teachers because their guardians aren’t ready for transferring their sponsorship to schools. Now under monitoring of MoE female teachers can easily work in schools without need to transfer sponsorship (iqama) to school and schools will be responsible for their medical insurance. As per Saudi Labor Law, daily working hours cannot exceed 8 hours so the same will be effective for female teachers. Additionally female teachers are entitled to 21 days paid annual leave. There are further benefits for pregnant working females. They can have a maximum of 10 weeks maternity leave. They have a right to get 1 hour break for breast-feeding their children. Furthermore employer cannot fire a female during maternity leave and the employer will be responsible for all medical expenses for the pregnant female teachers. These are some great benefits female teachers will get, Thanks to Saudi Arabian Govt. If you are not familiar with how to get your family in Saudi Arabia, read this post. 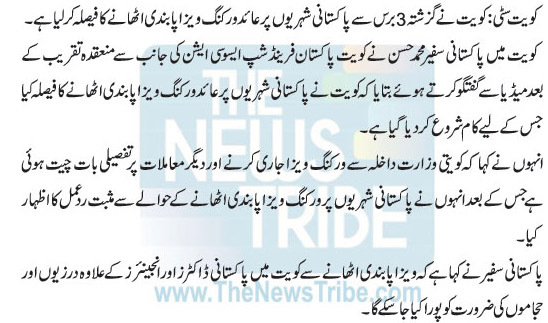 According to “the news tribe” Kuwait government will soon lift ban on visas for Pakistanis. This ban is started in 2011 which includes 6 countries and Pakistan was one of them. One reason of this ban was to control increasing number of expatriates in the country. According to a Kuwaiti newspaper, Kuwaiti government finalizes to introduce new laws and conditions for visa issuance. This could be a great decision for Pakistani workers who are looking to go abroad for a bright future of their families. Below is a screenshot from the source of news.